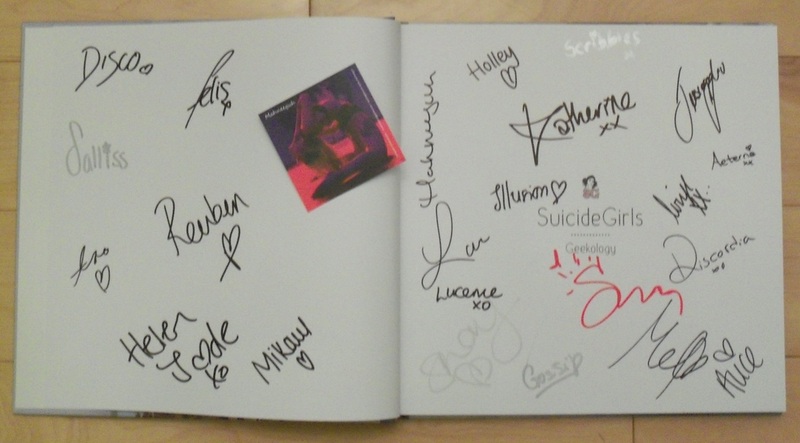 Signed UK HB first edition - signed by Alicesey, Aro, Disco, Felis, Helenjade, Holley, Jessicalou, Keshia, Lucerne, Marly, Mel, Mistyh, Nancyy, Reuben, Rouge, Scribbles, Seren, Tindz and others. ﻿Synopsis : The SuicideGirls are a collection of more than 2,500 pin-up girls devoted to changing your idea about what makes a woman beautiful ... and they are naked. Started in Portland, Oregon, by Missy Suicide and her friends in 2001, the SuicideGirls broke conventional notions of beauty and the pin-up girl ideal as defined by men s and women s magazines and the culture at large. SuicideGirls: Geekology casts the spotlight on the self-proclaimed geeks of the SuicideGirls population the video-game players, the comic-book readers, the Trekkies, and many other shining examples of the culture they re celebrating. There s something really wonderful about this book. There s something beautiful around the idea of showcasing girl geeks in all their glory: to go beyond the photos and find out that, to us, each piece of the picture means something. To find out how many hours we put into designing our cosplay and how attentive we are to the homages we create. We re not just playing dress up in a world we know nothing about. We were right there with it, helping to build popularity from the ground up: first in line, issue number one. Once a subculture of a subculture, women are now a full force in the geek community.